An essential step to help your child, and your entire family, to stay in shape is to develop healthy eating habits. The eating habits your children pick up when they are young will help them maintain a healthy lifestyle when they are adults. Encourage your child to eat slowly. A child can detect hunger and fullness better when eating slowly. Eat meals together as a family as often as possible. Try to make mealtimes pleasant with conversation and sharing. If mealtimes are unpleasant, children may try to eat faster to leave the table as soon as possible. Involve children in food shopping and preparing meals. 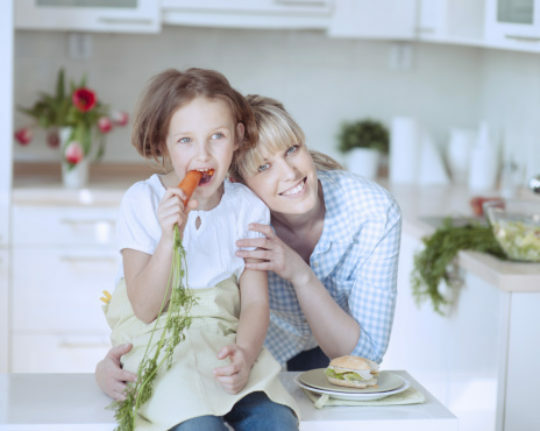 These activities offer parents hints about children's food preferences, teach children about nutrition and provide children with a feeling of accomplishment. Plan for snacks. Snacks planned at specific times during the day can be part of a nutritious diet, without spoiling a child's appetite at meal times. You should make snacks as nutritious as possible, without depriving your child of occasional treats such as chips or cookies. Don’t withhold food as a punishment. This may lead children to worry that they will not get enough food and they may try to eat whenever they get a chance. Similarly, when foods, such as sweets, are used as a reward, children may assume that these foods are better or more valuable than other foods. Make sure your child's meals outside the home are balanced. Find out more about your school lunch program, or pack your child's lunch to include a variety of foods. Also, select healthier items when dining at restaurants. Be mindful of large portion sizes when eating out, and take half of the meal home for a second meal.